In May of 1981, a reconnaissance trip to the Santo Domingo Canyon looked at Cueva de la Peña Colorada, an enormous fossil resurgence cave. Later in 1982 Sump 1 was explored for 524 meters to where it opened into an air-filled tunnel. A further kilometre of dry cave leading northward towards Sistema Huautla was then discovered. Sadly, exploration was halted by the discovery of a second sump. Connecting this tunnel with the deepest known point in Sistema Huautla (10 kilometers away and 300 meters higher) became the primary objective of the 1984 expedition. A total of 7.8 kilometers of virgin territory leading into the plateau were surveyed on this expedition, with 1.4 kilometers of this distance totally underwater. This was comprising of 7 sumps, the longest of which was 524 meters in length. 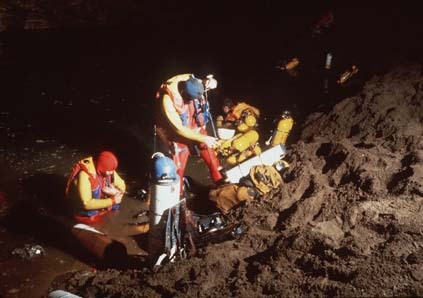 The expedition established the first ever subterranean camp set beyond an underwater tunnel. The team was stopped by sump 7 - a large sump at the bottom of a 55 meter deep shaft (with no dry land). This was explored for 165 meters to a depth of 55 meters. This has now been more than three decades ago, and nobody has returned since. 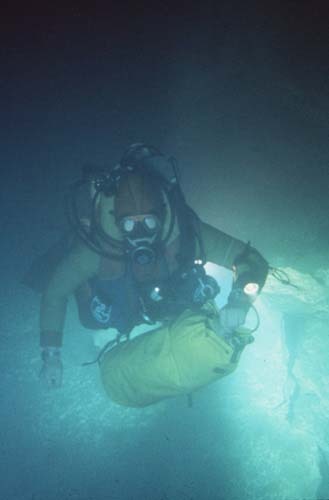 The problems with open circuit scuba: Rob Parker transporting a "sled" of 8 composite tanks through Sump 3 at the Peña Colorada. Multiple sherpa trips carrying loads such as this were required to support pushes on more remote sumps. Seige logistics meant an equipment pyramid: on the final push the team began the effort with 72 scuba tanks. At each sump, some tanks, and people, had to be left behind while the lead divers (and their support teams) proceeded forward. Ultimately, only 5 tanks reached Sump 7 for the final push. Pat Wiedeman (left), Bob Jefferys, and John Zumrick kit up at Sump 3. 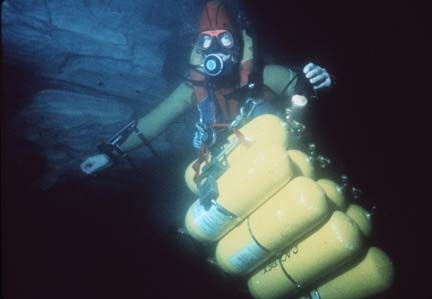 This was the first extensive use of composite tanks for cave diving (the dive at the San Agustin Sump in April 1981 was the only previous effort to use this technology). The team used 72 of the composite vessels (manufactured by Acurex [now EFIC]) to traverse six sumps and 4.2 kilometers of dry cave galleries separating the sumps. Sump 3 was 190 meters in length and reached a maximum depth of 22 meters. Sump 7: The Ultimate Speleological Obstacle. 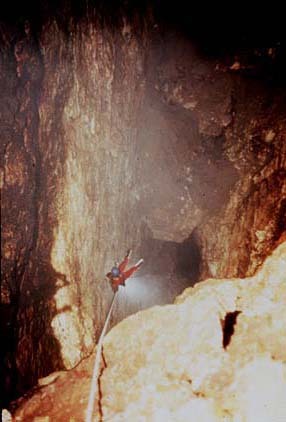 Noel Sloan is shown here descending the 55 meter freefall drop leading directly into Sump 7, the most remote underwater tunnel discovered in the Cueva de la Peña Colorada. Rob Parker transporting gear through Sump 5 (140 meters long). 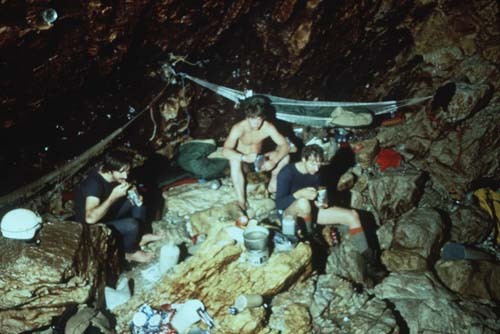 Inside the duffel were food supplies, carbide, and climbing gear needed at Camp 2. 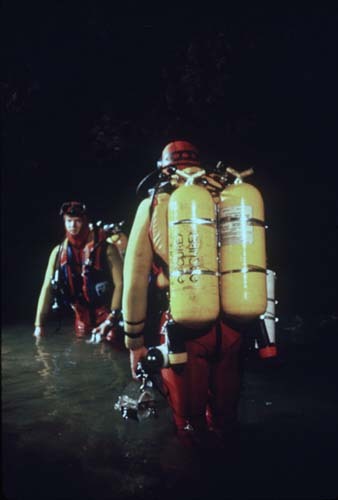 Clark Pitcairn (left) and Gary Storrick prepare for the original exploration dive in Sump 2 in late February 1984. The tanks are the novel fully overwrapped composite design first used during the 1981 Agua de Cerro Expedition. Spartan Outpost: Left to Right: Bob Jefferys, Rob Parker, and Noel Sloan work on a humble meal of freeze dried food at Camp 2, 4.2 kilometers from the entrance and beyond six sumps comprising a kilometer of underwater travel. Camp 2 was occupied for 7 days during the 1984 expedition. Team photo during training in the fall of 1983 at Indian Springs, Florida. Rear, left to right: Carlos Lazcano, Elena Lazcano, Pat Wiedeman, Bill Stone, Gary Storrick, Bob Jefferys, Clark Pitcairn, Noel Sloan, John Zumrick, Sergio Zambrano. Front, left to right: Clark Daily, John Evans, Rob Parker, Angel Soto.